“Be the Martyr” amounts to a whole lot of people finding out about stuff and reacting to finding out that people have found out about stuff. That can technically be said of a lot of mystery narratives, which hinge on the push and pull of big reveals and characters reacting to those reveals. But something about the way this particular episode of How To Get Away With Murder unfolds is especially tedious and, ultimately, empty in its portrayal of people discovering and reacting to things. 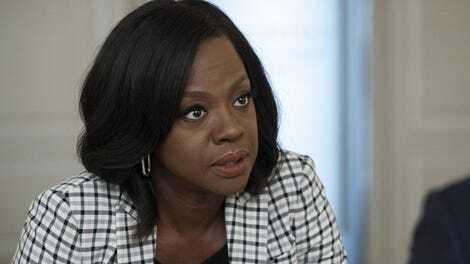 Annalise finds out that the other students know about Nate killing Miller, too, and then the students react to Annalise knowing they know, and it all just takes up a lot of time without really saying much. Even Bonnie’s confession to Asher that she is the one who really ended Miller’s life by finishing him off when he was still gasping for breath doesn’t hit very hard—maybe for the sheer reason that it’s Asher, whose only purpose on this show lately has been to learn things and make a reaction face in response. “I hate our lives,” Michaela says, exasperated, at one point. It’s slightly funny, and it’s also indicative of a big problem with How To Get Away With Murder, which is that everyone’s lives have indeed become so exhausting and dismal that it’s getting harder and harder to watch. Everyone is miserable! It’s why some of the brightness of Connor and Oliver’s wedding vows were such a welcome relief from the otherwise joyless show that’s just about people digging deeper and deeper graves from themselves. There’s dark, and then there’s punishing, and How To Get Away With Murder increasingly falls into the latter. Take this whole Nate arc, for example. This is the most important that Nate has ever been on the show. His storyline has gone completely off the rails—and not even in a fun way. But beyond just that, the way that the show forced a very rapidly developed relationship with his father only to give weight to Nate Sr.’s death is just bad writing. The only thing better at emotional manipulation than most of the characters on this show is the show itself. It’s getting harder to care about who lives and dies, which makes watching the a show a disturbing, meta dive into existential distress. The characters are exhausted. When was the last time anyone had any time to breathe? We follow Nate on this journey of guilt and determination. He feels so crushed by the possibility of having killed an innocent man that he sets out to prove Miller’s involvement in his father’s death by any means. Unfortunately, most of his connections aren’t as willing to help him out these days. 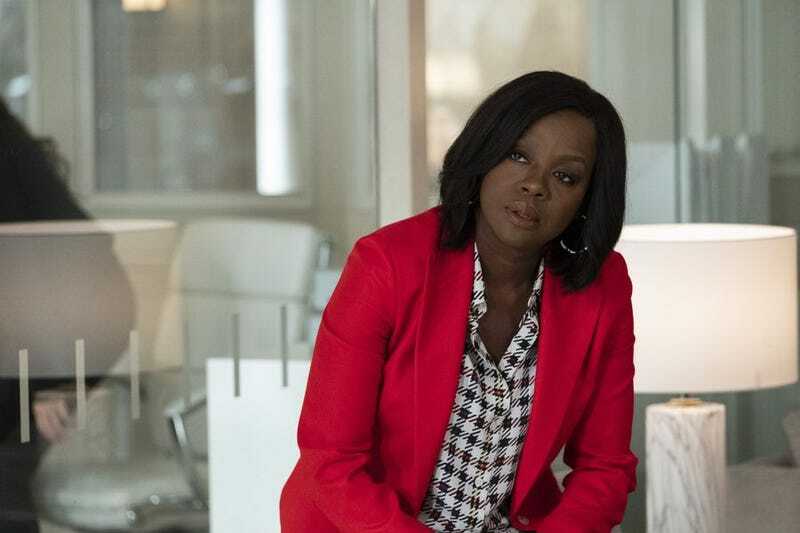 In any case, How To Get Away With Murder is pretty stuck when it comes to this storyline. It’s hard to become invested in Nate trying to prove Miller was bad, because there’s very little doubt about Miller’s innocence. But then if it does turn out that he was involved in the hit on Nate’s dad, it just wouldn’t make any sense whatsoever. Miller has to be innocent, and yet his innocence makes Nate’s arc so difficult to swallow. Nate doesn’t quite work as an anti-hero, and yet How To Get Away With Murder is suddenly pushing him as one. And then there’s Bonnie, the most tragic character on this show of mostly tragic characters. She loses when she goes up against Annalise. She loses when she aligns herself with Annalise. And when she finally got a glimpse of goodness in the form of Miller, something still was off. Bonnie and Miller’s relationship developed quickly, was forged by convenience and rarely felt organic. It feels like the relationship’s only purpose was to give Bonnie yet another tragic storyline, to put this character through the ringer yet again and make Frank swoop in and save her yet again. One of the most compelling parts of the episode ends up being a pretty small subplot surrounding Laurel. It’s relegated to the background, but it strikes that How To Get Away With Murder sweetspot of turning melodrama into a meaningful message about trauma and mental health. Laurel becomes understandably distraught that Christopher witnessed murder, and she goes after Bonnie with her concerns. Laurel’s internal and external struggles here are powerful; she has every right to be furious, but it’s also understandable that she questions her own reaction, starts to feel a little bit crazy—something that has always been a sensitive spot for her. At first, other characters and Laurel just spout out statistics about young children witnessing violence leading to PTSD and mental health side effects. That’s all fine; this show often uses its storylines to disseminate relevant and important facts. But it’s always more interesting when it can make those issues feel more personal, more grounded in a sense of character. Michaela steps in and says it’s not always the case. She knows because she experienced it. She was in the room when her birth mother was shot, and she doesn’t remember a thing. “It was like it never happened,” she says. And sure, she has her issues, as everyone on this show does, but overall, she’s pretty well adjusted, doesn’t suffer from debilitating PTSD. It’s a sweet moment and the only thing that genuinely calms Laurel. Michaela and Laurel are increasingly one of the healthiest relationships on the show other than Connor and Oliver. That brief glimpse of friendship, of empathy and vulnerability, is the only glimmer of light in the episode. “My head is always in the game.” This is a fun Annalise line, but it reminded me that she’s drinking again. So is her head currently in the game? The way Annalise dismisses Laurel’s Christopher concerns is rude. Liza Weil is great. Watching Bonnie dissociate through most of this episode and also contemplate suicide is very tough. The use of flashback in this episode isn’t as impactful as it wants to be. Wow it’s hard to care even the tiniest bit about Emmett. The fact that he gets a whole storyline wedged into here is wild. It’s an already overstuffed episode, and his arc has little to do with the rest of what’s happening (so far).